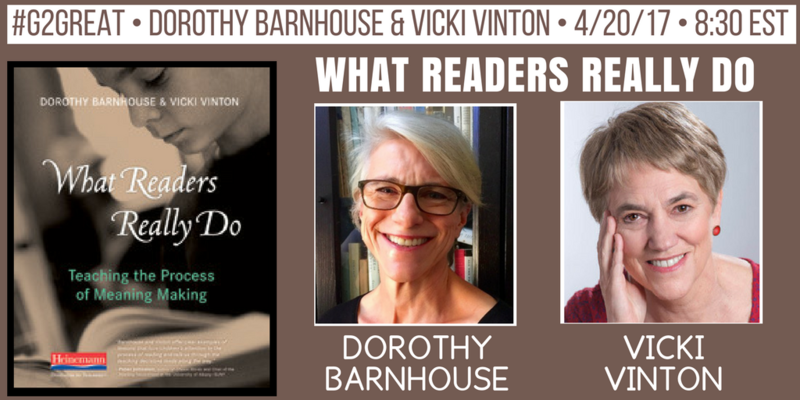 On 4/20/17 #G2Great was honored to open our welcome door to guest hosts Dorothy Barnhouse and Vicki Vinton as we explored their co-collaboration gem, What Readers Really Do: Teaching the Process of Meaning Making (Heinemann 2012). 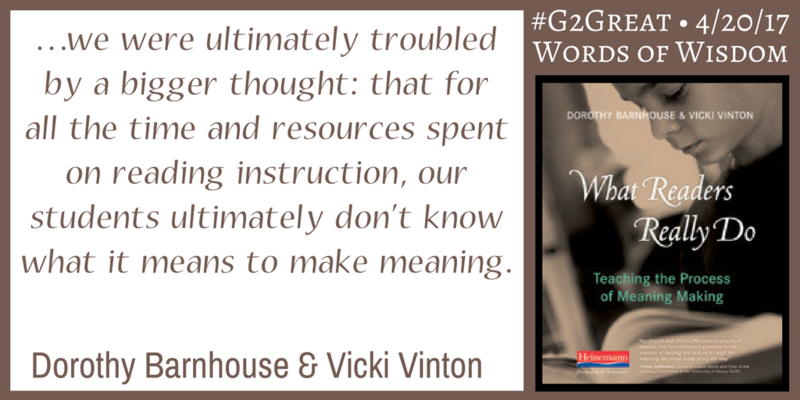 From the opening tweet, it was evident that our #G2Great family wanted to be privy to what readers do. With our dynamic writing duo leading the way, we launched into a joyful exploratory venture Twitter style. 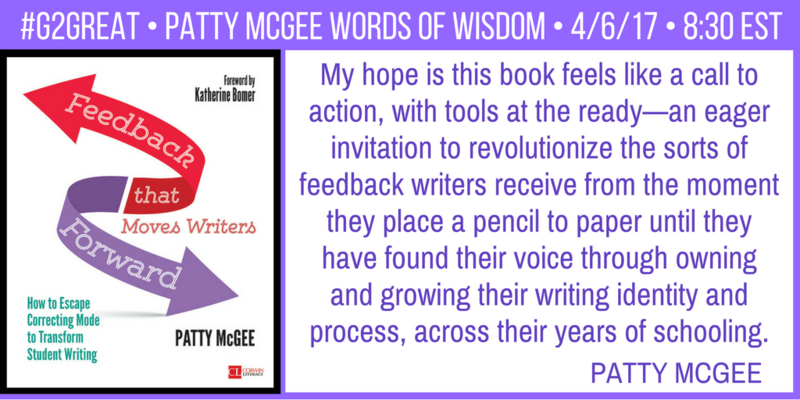 As I thought about the inspired chat dialogue, I realized that the same thing that motivated Dorothy and Vicki to write their book drove our collective enthusiasm. Through writing, they sought to understand the thinking students do in the course of their reading, motivated to ‘stalk the invisible’ for reasons reflected in a quote we shared at the beginning of the chat. What Readers Really Do reads like a reflective diary of their efforts to confront this conflict. As the pages of their book unfold, we come to understand how they resolved their conflict through a thoughtful negotiation to new thinking that would ultimately change the way they approached reading. Through our shared conversational collaboration, we grew increasingly confident that their journey to new thinking would help us negotiate our own. Two early tweets from Dorothy and Vicki set the stage for tackling this issue by shifting our perspective from time as a challenge to time as an incentive. We still acknowledge time constraints we all face but adjust how we view time. We tackle this challenge by insisting on expending our precious available time in the most authentic and productive ways in spite of the inevitable challenges. What do readers really do and how can teachers create an environment that invites and nurtures readers to do those things with or without our support? In order to build a thinking bridge to independence, we begin by sharing the thinking that takes place as we read. By making our thinking public we are able to stalk our own invisible in order to make the invisible visible. Dorothy’s inclusion of the words “authentic” and “joyful” should be a reminder to us all to celebrate the authentic joyful spirit or reading and avoid reducing how we interact to student reading through a recipe of thoughtless sameness. An essential theme running throughout the book and tweets is the idea that we teach this thinking process so that students will eventually take ownership of that process. When our primary goal is to build identity and agency, we know that we must keep this goal in our sights from the beginning. We do this by offering support in the early stages but we are prepared to watch for the signs that will allow us to fade our support into the background as students assume increasing control of their own thinking. Making room for students to assume control of their own thinking is not about asking them to replicate our thinking. Rather, our thinking offers a supportive scaffold to help them construct their own meaning as they apply this process. This means that naming a strategy is far less relevant than helping them to be more intentional and strategic each time they engage in the thinking process. Over time and through practice, they will begin to internalize this thinking. In order to support the thinking students engage in, we must be willing to stalk their invisible in action. To do this, we must be present in students’ learning moments on a day-to-day basis so we can notice and celebrate the thinking that often happens when we least expect it. We adjust our stance from teacher to observer so that we can use our observations as stepping stones that will lead them to powerful new thinking opportunities in a wide range of varied text opportunities. Teachers who are aware of their own thinking recognize that this process is a messy one. We know that the road to discovery can be littered with confusion, uncertainty, and possibility. Such a journey takes time so we must be willing to create experiences where students have time to linger a bit longer even when riddled with confusion, uncertainty, and possibility. This path Dorothy calls ‘huh’ to ‘oh’ is recursive rather than linear and so we support the unexpected twists and turns of thinking that can lead them from one discovery to another. We support this messy process as we become expert kidwatchers. Certainly our role as kidwatcher begins by noticing what students are doing as they read but we know that we must make them cognizant of our noticings. This allows us to support their efforts by exploring how we can use their reading to move them from where they are to where they could be. While increasing awareness of their own thinking as they read is an important part of this process, we know that awareness of NOW thinking must lead to purposeful NEXT thinking. Noticing student thinking can help them take ownership of their own thinking if we are responsive to this process. We recognize that our responsibility is not to teach students to be compliant disseminators of knowledge by responding to preconceived answers but to pose genuine ponderings to help them to move to deeper thinking. Once we acknowledge their thinking we must then help them understand how they arrived at that thinking in the first place. This combined understanding moves them closer to agency, ownership, and independence. When we acknowledge thinking as a process we must also acknowledge all that this implies. The dictionary defines process as a series of actions or steps taken in order to achieve a particular end. We do not view their thinking in terms of a product to be gathered at the end of reading but as a process to be supported each step along the way. Vicki celebrates this view by referring to thinking as a process of drafting and revising. We expect thinking to grow or even change and so we nurture the winding path to understanding. 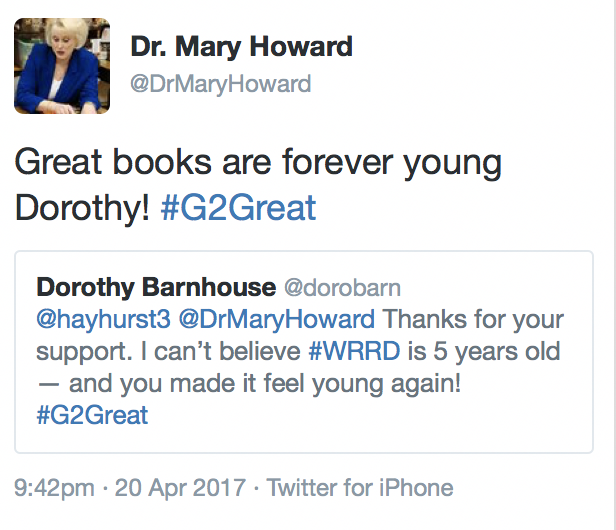 After the chat ended, a final tweet with Dorothy afforded me an opportunity to make a shameless book plug. At #G2Great we see ourselves as professional cheerleaders committed to doing our best work for students. In the past few months, we have celebrated authors who share our passionate commitment to students. We spotlight their books at #G2great because we know their words have the potential to transform every classroom into the learning spaces our children deserve. And thus my shameless plug. We don’t just celebrate new books at #G2Great because we worry that amazing books like What Readers Really Do may be missed simply based on a 2012 publication date. We are on a mission to put books, old and new, into teachers hands because the advice of amazing authors is truly “forever young.” But rather than taking my word for it, download a free chapter of this exquisite book also available as an ebook. Thank you Dorothy and Vicki. Your words exemplify forever young and will continue to inspire us to do this important thinking work with our students now and in the future! 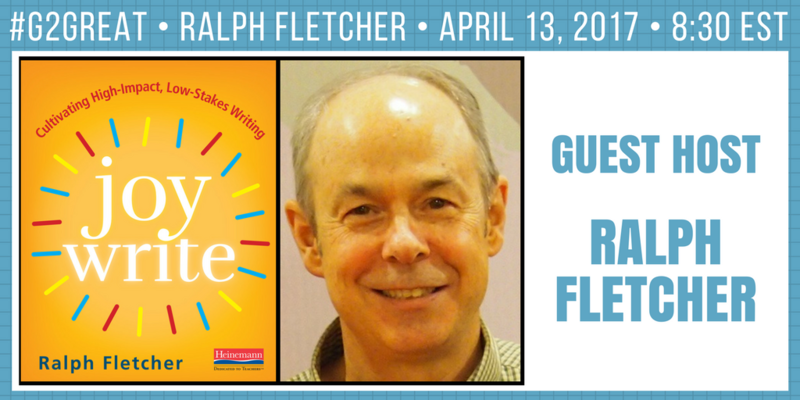 On April 13, 2017 #G2Great welcomed Ralph Fletcher as a guest host to share ideas from his newest book, Joy Write: Cultivating High-Impact, Low-Stakes Writing. In his book, Ralph invites us to take on what I believe to be the most important lens when it comes to writing. Ralph guides us by suggesting, “We must strive to see the writing curriculum through their eyes, as they experience it, from their points of view.” All too often we view the teaching of writing through our own perspective, making instructional decisions through that lens. If we stop and switch the lens to view the learning environment from our students’ eyes we can clearly see the essentials that lead to real growth in writing. Student-centered classrooms where students have autonomy and choice in writing open up opportunities for students to write about what is personal to them and the topics or issues that they are passionate about. We began the chat with a discussion around critical characteristics of a student-centered writing classroom. Ralph reminded us of the importance of low stakes writing, and when you have the lens of the student, you realize how critically important it is to have students engage in writing in an environment where students do not feel high stakes pressure. They need to feel safe to take the risks that a writer takes as they play with language and grow their writing. Providing students with choice and time in order to engage in writing connected to their passions and interests creates the environment where students will experience the most growth. When Ralph led us through a discussion around choice, he pointed out so many aspects of choice in writing that extend beyond the just choice of topic. Check out his tweets below and be inspired to create ways in your classroom to open up opportunities for increased autonomy. I am especially intrigued by Ralph’s idea of inserting open cycles of writing in between our units of study. These open cycles provide students with a wider option of choice than what we generally allow and are beyond the topic choice. There is value to working in a shared unit of study, as a community studying a particular type of writing and learning together, however there is something so simple and appealing about dropping in an open-cycle between units. In this open cycle students choose topic, genre, audience and really everything in the writing process. Ralph urges us to see this is truly the way writers grow. Below you can see some of Ralph’s tweets on this topic and you can think a little bit more about why and how you might institute open cycles in your classroom. Stating with your core values, sustained writing – everyday. This essential ingredient is the one we must hold closest to us and never stray from. The time we dedicate to writing provides the time for students to engage in the writing process and grow as writers. Ralph tweeted that everything else after this is negotiable. 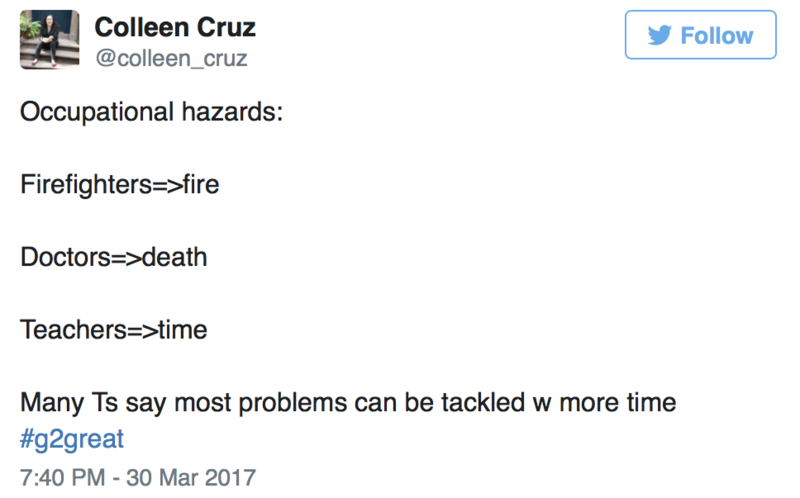 This tweet really helped to send the message home. In this new book you will want to learn more about his new idea of “greenbelt writing,” a type of informal writing that is raw, unmanicured and uncurated. It is through this writing environment that Ralph shows us that students can demonstrate not only tremendous, but JOY in writing. I am filled with complete gratitude because as @TeachWriteEDU put it, “there is so much goodness here…” this chat spurred me to think about some questions we all can ask ourselves. 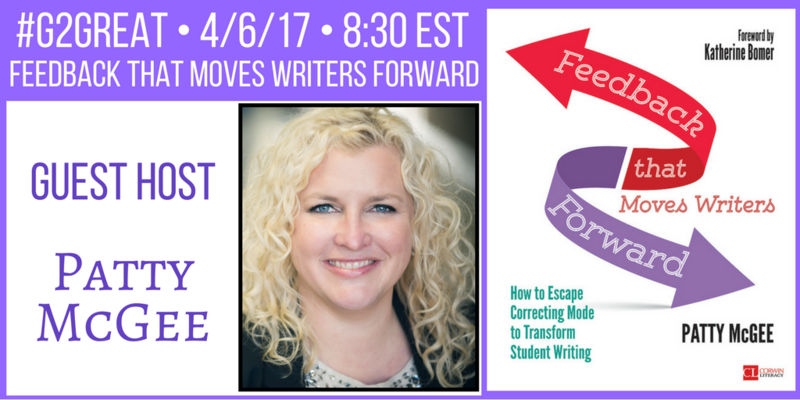 How does feedback influence our writing identities? What experiences formed your writer’s identity? Yellow sunlight streamed in through giant panes of glass, warming us as we sat around the kitchen table. Coffee cups steamed darkly in contrast to the brightly painted porcelain cow creamer. Her mouth, forever frozen, in an open circle of surprise. There I was drinking actual coffee with my father! No longer just a gawky twelve year old girl. No, now I am a writer. I am one of two writers, drinking coffee, and thinking deeply. My dad leaned over my paper, loosely holding pencil in hand and laughing at the funny parts. A swell of emotion filled me and I became light headed. I don’t know if came from the caffeine or the pure elation at his response to my writing. That experience marked the beginning of a lifelong love with writing… and coffee. 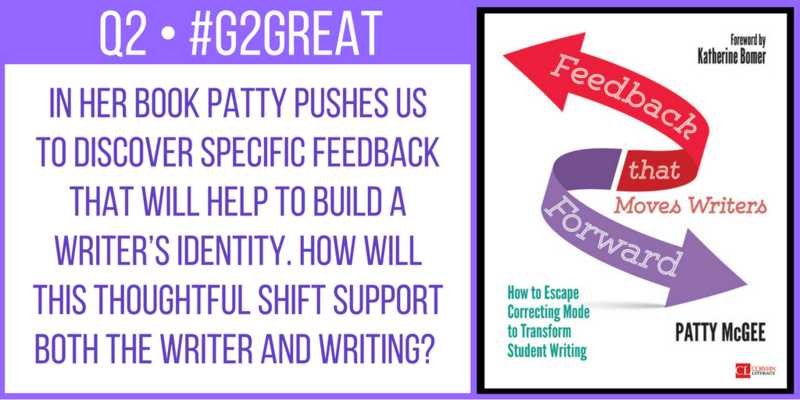 A Call To Action – A #G2Great Community of Writers: What’s your story? We invite you to reflect on the experiences that have shaped your writing identity. Blog about it, so that we may leave each other feedback that elevates our practice. If you leave your links in our Comment Boxes we can continue to examine who we are as writers and practice giving feedback that pushes writers forward. We can generate writing experiences for ourselves so we may lift the level of writing for our students. I have been privileged to know many unstoppable educators over the years and I am convinced that inextinguishable flames of educators ON FIRE is the fuel that drives them to move along a pathway in a life-long professional journey to unstoppable. In the foreword to Colleen’s book, Lucy Calkins asks us to name our fears as we linger in ‘uncertainty and doubt’ where hidden opportunities reside. Calkins is the very definition of unstoppable, so we began by asking our #G2Great family to identify their fears in the form of challenges that can thwart our efforts to become the unstoppable writing teachers our children deserve. Colleen led this discussion by highlighting a challenge that was reiterated in one form or another in tweet after tweet. Teachers who make writing a daily priority would be first agree that choice is a critical factor for developing as writers at any age. Colleen reminds us that all writers gravitate toward topics that reflect their passions. Through our passions we stand to learn a great deal both about our topic of choice and the process of writing. 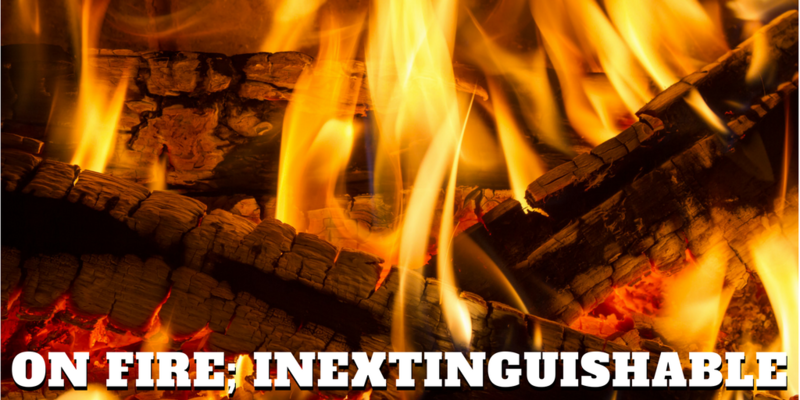 Unstoppable writing teachers on fire know that choice feeds burning embers of desire in ways that inspire us to put words on paper in the first place. Choice honors writing as a personal venture. It is simply not possible to teach writing well without an insider’s perspective. This means that as professionals we immerse ourselves in the very process we are teaching by making our own writing a daily priority. With that first hand view of writing and the struggle that comes hand in hand with our commitment to writing, we can then make each aspect of what it means to be a writer public at all stages. Making our own thinking visible gives students a front row seat to what we do as writers so that we can then offer them opportunities to apply this thinking in their own writing – first with support but then ultimately on their own. This is the SHOW don’t tell spirit at its finest. Colleen’s tweet was a celebration of students as teachers from Jenn Hayhurst and Jill DeRosa. We model the process of writing and offer support to build a strong foundation of understanding, but then we step back so students can put their new learning into action without us. This stepping back gives our writers room to assume a lead role as we encourage independent problem solving. We have the courage to let students spend more time in the writers driving seat than out of it so that they will have the real life opportunities to meet the inevitable struggles that come with writing as they assume increasing control of their own writing life. Since we can’t teach writers we don’t know, we draw from a wide range of formative assessment practices. These day-to-day opportunities fill us with the knowledge about our student writers we can then use to support them in the course of their own writing. Colleen highlights kidwatching as a powerful knowledge gathering process. Once we step back and put our student writers in the driver’s seat, we then have the freedom to enjoy the view as students actively engage in writing – both within and beyond the struggle. With this freedom to become an observer comes understandings that will inform our next step efforts. While whole class writing instruction is one component of a powerful balanced writing design, we must also create varied structures that will allow us to meet the needs of unique learners. This differentiated support affords us time and space to meet those unique needs. To accommodate these support opportunities we need instructional frameworks in place, making side-by-side and small group support designs essential. These targeted support opportunities allow us to address the specific challenges writers face in their own writing as each writing opportunity is a springboard to support the writer in front of us. Colleen’s exchange with Tara Smith reflects that unstoppable writing teachers support students on their journey to becoming unstoppable writers. 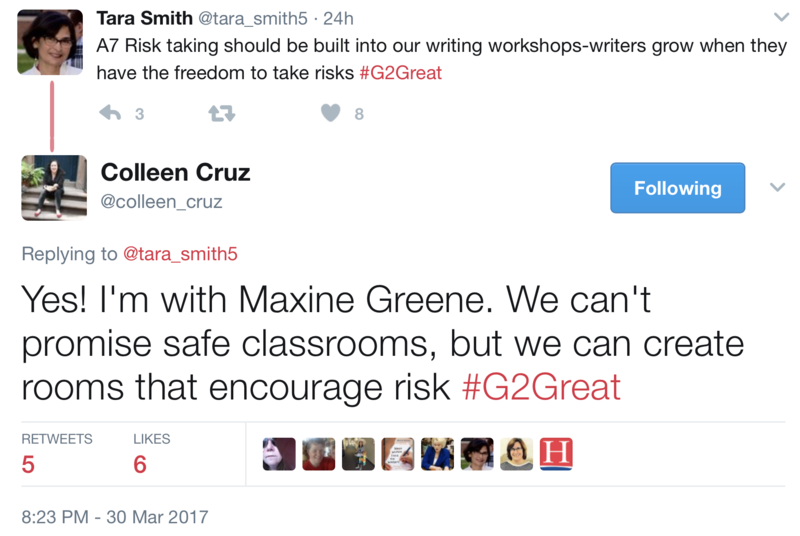 Colleen reminds us that this risk-taking only happen within a safe learning environment where writing risks are both invited and honored. This supportive environment of risk-taking in great volumes, benefits both the teacher and student on their personal journey to unstoppable. 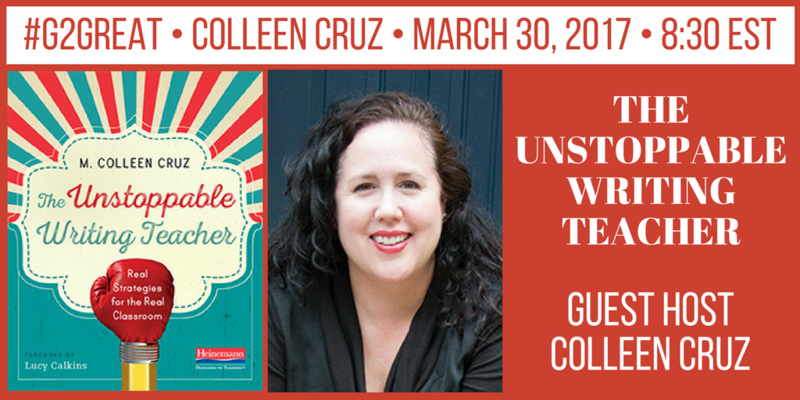 As I close my reflection on an amazing #G2great chat with guest host Colleen Cruz, my initial definition of unstoppable comes back into focus. These seven stepping stones to unstoppable bring to mind classrooms where both teachers and students are ON FIRE and those flames are inextinguishable when we make it a priority to celebrate the writing and writer from all sides – ours and theirs. Thank you for supporting our personal journey to UNSTOPPABLE, Colleen!